This simple, two-ingredient raspberry jam recipe has an intense flavor that requires no added pectin and produces a small batch of 3 cups or half-pints. You will note that it has a lot of sugar and not just to add required sweetness. It is the preservative element that extends the shelf life of the jam. It's also needed to gel the jam; if you reduced the amount of sugar, you would need to use pectin to get the jam to set up. When you have a bumper crop of homegrown raspberries, try making this jam with them. If you don't have a garden full of raspberries, fresh from the market or frozen raspberries will do just as well. Look for very ripe fresh raspberries, as they will lend the most flavor to the jam. Cooking underripe berries won't make them taste better. Frozen raspberries are a good choice as they are often made with very ripe berries. If you're worried about fruit that has been sprayed with chemicals or pesticides, you can find organic frozen berries at many supermarkets and warehouse stores. The equipment you will need for this recipe includes a large pot, potato masher, canning jars and lids, and a water process canner or alternative. 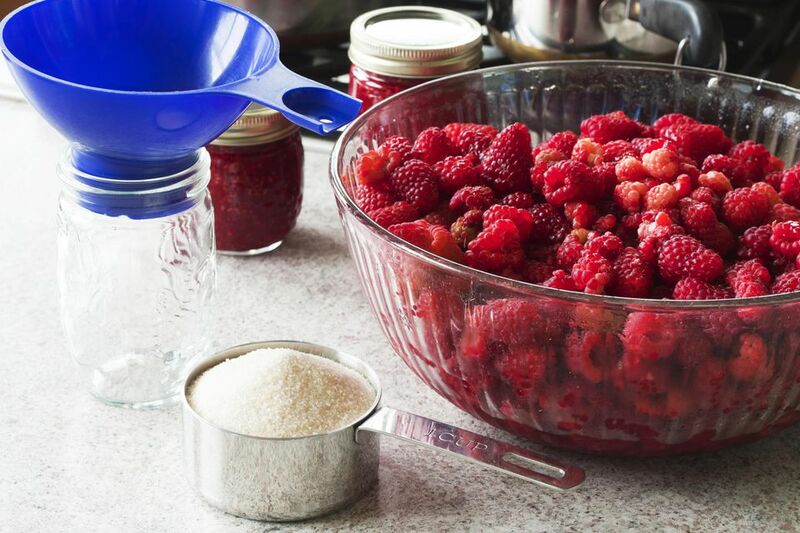 Combine the raspberries and sugar in a large stainless-steel or enameled pot. Cover and let them sit overnight. This maceration time releases the juices from the fruit and shortens the cooking time. Sterilize the canning jars by boiling for 10 to 15 minutes in a hot water bath. Prepare the canning lids according to their directions. Mash the fruit and sugar mixture with a potato masher to break up the berries. Place a plate in the refrigerator to chill for the gel test. Bring the jam mixture to a boil over high heat, stirring often. It will foam up and expand, so expect that when you choose the size of the pot to boil in. If foam forms on the surface, skim it off with a metal spoon or skimmer. Continue to boil, stirring, until the mixture reaches the gel point. If you use a candy thermometer, this is around 215 F.
Test your jam to see if it has gelled by taking the chilled plate, adding a spoonful of jam, and placing it in the freezer for 2 minutes. When you take it out, it is properly gelled if it doesn't run down the chilled plate, and when you drag your finger through it, the path remains intact. Ladle the jam into the sterilized jars leaving 1/4-inch headspace. Cover with canning lids and process in a boiling water bath for 5 minutes. Remove from water bath and let drain on a towel-lined work surface. After you hear the "popping sound" indicating suction and a good seal, tighten the bands. Let cool completely and store in a cool, dark place for up to one year for best flavor. If you don't want to go through the canning process, you can simply refrigerate the jam for up to three weeks or freeze it for up to one year.